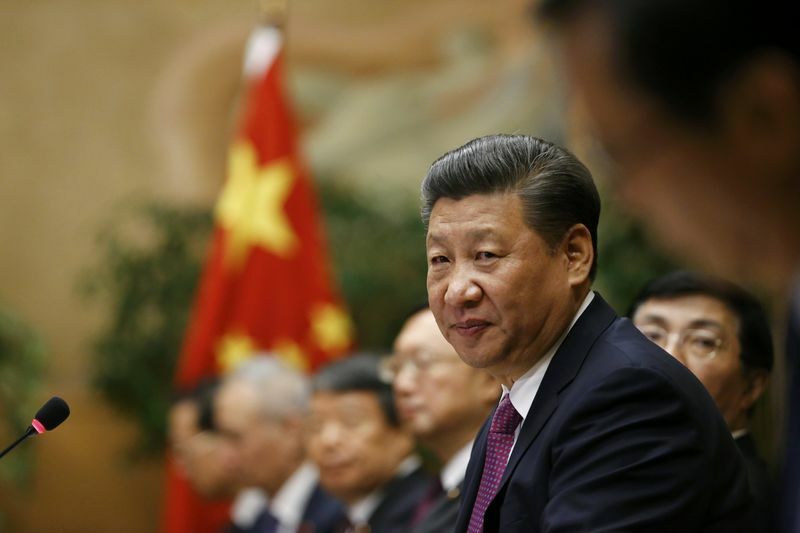 Escalating trade rhetoric continued to nag at investors after Chinese President Xi Jinping warned his cabinet to get ready for a “full-scale trade war”, according to a research note from macro-research firm SGH Macro Advisors. Xi made the comments during a meeting of China’s highest decision-making body, which gathered to discuss China-U.S. relations. Chinese officials have concluded it appears inevitable the U.S. will impose tariffs on $34 billion worth of Chinese goods on July 6, and will respond accordingly with tariffs of their own. The report added that the People’s Bank of China (PBOC) is ready to refrain from buying U.S. Treasurys, or even cut its purchases. China is a massive holder of U.S. Treasurys, and investors have been concerned about the impact of the PBOC shedding those bonds. The mounting trade frictions between the world’s two largest economies prompted a sell-off in global stock markets, including China, which entered bear territory. sank 2% to be a whisker above 13-month lows as a resolution of Sino-U.S. tensions remained a distant prospect. In addition, China’s central bank guided the to a six-month low against the U.S. dollar, sending the Chinese currency tumbling and stirring speculation Beijing was allowing its currency to weaken to bolster exports. U.S. stock futures pointed to sharp losses at the open, as worries over a brewing trade war between the U.S. and China kept buyers on the sidelines. At 5:55AM ET, the blue-chip were down 140 points, or around 0.6%, the slumped 12 points, or 0.5%, while the tech-heavy indicated a loss of 58 points, or roughly 0.8%. , but mixed messages from the Trump administration regarding trade kept a lid on gains. In earnings news, results from General Mills (NYSE:) and Paychex (NASDAQ:) will be the highlights. Elsewhere, as financials and industrials stocks suffered. Bank shares fell to their lowest since December 2016 while the autos sector, a prominent target of higher U.S. tariffs, neared a 10-month low. Earlier, , as further falls in Chinese stocks and the yuan sent ripples across the region. Away from equities, the against a basket of currencies, as concerns over heightened trade tensions continued to weigh on market sentiment. The , which measures the greenback’s strength against a basket of six major currencies, was 0.1% higher at 94.44. The dipped 0.1% against the dollar to 1.1635.
was effectively flat at 1.3210. Against the safe-haven , however, the greenback extended last session’s losses to trade at 109.85. The yen is often sought in times of market turmoil and political tensions. In the bond market, the edged down to 2.85%. Market players will focus on a fresh batch of U.S. economic data to gauge the health of the world’s largest economy. The Commerce Department will publish a report on durable goods orders for May at 8:30AM ET, amid expectations for a decline of . Orders for non-defense capital goods excluding aircraft – which serves as a proxy for business spending plans – is expected to show a rise. Data on the , , and for May will also be released in the morning, though nothing should be market-moving. Among central bank speakers, is due to speak about financial regulation at the Utah Bankers Association Annual Convention, in Idaho. The U.S. Energy Information Administration (EIA) will release its official weekly oil supplies report for the week ended June 22 at 10:30AM ET, amid forecasts for an oil-stock drop of . The data will also offer fresh indications on how fast domestic output levels continue to rise. production – driven by shale extraction – is currently at an all-time high of 10.9 million barrels per day (bpd). After markets closed Tuesday, the American Petroleum Institute said that U.S. oil inventories . ahead of the data, with rising 58 cents, or around 0.8% to around a one-month high of $71.09 per barrel, while were at $76.53 per barrel, up 39 cents, or about 0.5%. Oil surged on Tuesday after the from November, a State Department official said.